In many families it is a tradition to hang candy canes, gumdrops, gummy worms, sour tape, and other gummy candies on Christmas trees. In my opinion, it is time to revolutionize this tradition. From now on let’s start also hanging sushi rolls on trees. This way, everyone wins: kids have their candy (hello, tooth trolls) and parents may day dream about Nigiri, Tempura, and Sashimi while singing “Jingle Bells” for grandma for the hundredth time. Don’t you agree? Just look at the pic! Mmmmmhhh! The salivary glands in my mouth are speeding up their saliva production already. (sorry, can not suppress the tiny scientist in my head…) Real sushi would of course start stinking within three days. While this may provide a simple way to get rid of any unwanted Christmas guests, I do not recommend this. 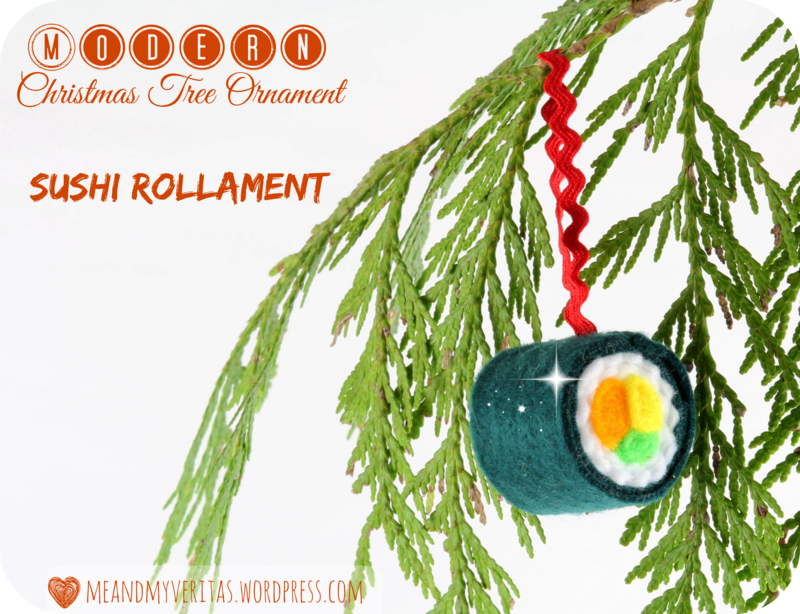 My solution is: Go for Felt Sushi Roll Ornaments, let’s call them Sushi Rollaments. 🙂 Super cute, fish-odor- and fat-free, and easy to do at home. To make these cuties, just read my Felt Sushi: Maki Rolls post and attach a string while sewing the roll together. It’s as easy as it sounds! Please click here and leave a comment… Ich freue mich auch sehr über Kommentare auf Deutsch. Doing this next year for sure!